If a channel uses lookups, you can individually define how to control the sensor status, either using the lookup definition or using limits for numerical values returned by the device. For details, see Sensor Channel Settings, section Alerting and Limits. Lookups do not change data in the PRTG database, they merely change the way sensor channels are shown. Any change to lookup definition files will apply to historic data as well as to live data. Some exceptions apply to the SNMP Custom String Lookup sensor that basically does an "inverse lookup". It does not map an integer to a text message but only looks for matching strings in the lookup definition and shows a status based on this text value. Customizing lookups is not possible on PRTG hosted by Paessler. All sensor channels with enabled Value Lookup need to use the channel Unit "Custom". For details, refer to the section Sensor Channel Settings. PRTG can display gauges or switches for channels that use lookups. 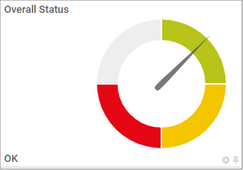 We recommend that you stay below 120 lookup values to display informative gauges for primary channels. Non-primary channels have an upper limit of around 40 lookup values for gauges. Lookups are defined in XML format in files ending in .ovl. PRTG standard lookup files are located in the PRTG program directory in the \lookups subfolder. These files are maintained by PRTG itself. In each of the files, lookups are defined for one or more sensors. Furthermore, the lookups folder contains the \custom subfolder to store your customized lookups. Use the SNMP Custom String Lookup sensor to map a string into a corresponding status. Please use the lookup type SingleInt for this purpose. You cannot access this directory on PRTG hosted by Paessler instances. The ID that is shown in the Sensor Channel Settings. The desiredValue attribute contains the value that is used for the calculation of the "Coverage". In this example, 1 is defined as desired value. The xsi attributes refer to the predefined XML schema definitions in PRTG (which allow easy editing of lookup files with supported editors). We recommend that you use the default value. Defines the ID of the channel, what desiredValue is used, the status for undefined values (undefinedState), and links to the predefined schema definitions in PRTG, which allow editing of lookup files with supported editors. id: Specifies how the name of the lookup file is shown in the Sensor Channel Settings. The id is parsed as lowercase string. State must be capitalized for the sensor to work properly. value: defines the value that triggers the lookup. Please enter an integer value. Range needs always both values "from" and "to". status text: defines a status text that will be used as substitution text and shown instead of the integer value. For example, a status message. The SNMP Custom String Lookup sensor maps the status text into one of the given states. Please use SingleInt for this sensor. All default lookup files are located in the \lookups subfolder in the PRTG program directory. To customize existing lookups, copy the desired lookup file from the lookups folder to the \lookups\custom subfolder or create a new .ovl file there. When using the same ID in the ValueLookup tag, the files in the \lookups\custom folder will have a higher priority than the original files in the \lookups folder. This way, PRTG handles your customizations preferentially instead of the original lookup settings. If you want to use custom lookup definitions in addition to the existing lookups, define a new ID in the lookup file that is not used by another lookup file. PRTG identifies lookup definitions via this ID, it does not use the file name. Open the file with an XML or text editor and adjust the lookups to your personal preferences. You can define your own messages as well as customize sensor states for the particular return values. For example, if you do not want to show an "Error" (a sensor Down status) for the return value "2" but only a warning, then you can replace "Error" with "Warning". The possible states are given in the LookupState.xsd file in the custom directory. Following the schema of the XML files that are delivered with PRTG enables you to edit the lookups in a safe way. If you imported an oidlib file that contains lookups (you can see this in section Lookup in the MIB Importer), you can define your own sensor states for returning values. If you add an SNMP Library sensor using this oidlib, PRTG will create a lookup definition file using the lookupname of the chosen library as id parameter. Override this lookup definition with your own custom lookup as described in this section. This is important because lookups that are added via an oidlib will not contain any status definitions and result in a Warning status of the sensor by default because of the entry undefinedState="Warning". If you use an SNMP Custom String Lookup sensor, you can create a new custom lookup definition in the \lookups\custom directory with the expected return values. In this case, use the lookupname of the chosen library as id parameter to override the lookups from the oidlib file. When you save an edited lookup, make sure that it is saved as an .ovl file. Otherwise, the lookup might accidentally be saved as a .txt file and might not be loaded. Add a "SingleInt" element with status "None" for the (hypothetical) return value "3". See also SNMP Custom String Lookup Sensor—Example for a lookup definition that maps a string value to a sensor status. It is necessary to define a desiredValue in the lookup files. The desiredValue corresponds to a status value triggering a lookup. PRTG calculates the percentage of time this specific status has been monitored. The result is displayed for all data tables and graphs that show averaged values. Considering the example above where the desiredValue is "1", PRTG will calculate the percentage of time the toner status has been "Warning". If in a time span of five minutes, four of five sensor scans returned a "Warning" status, PRTG would show an average of 80% for this time span because 80% of the time, the sensor showed a "Warning". Besides the lookup type SingleInt as seen above, there are three other lookup types: Boolean, BitField and Range. Using these types, you can define lookup values beyond simple integers. The full 32-bit integer range is supported. Uses 0 or 1 to define a lookup for two different status values. Only use it if you have basic knowledge about bitmasks. See the section More below for a general introduction. Every value has to equal a power of two (for example, 1, 2, 4, 8, 16, 32, 64, etc.). The SNMP Custom String Lookup sensor does not support BitFields. Using ranges, the parameters "from" and "to" always have to be defined. If you want to query only one single value in a range file, this value must be set as parameter for "from" and "to" (for example, from="2" to="2"). The SNMP Custom String Lookup sensor does not support ranges. You can use only one kind of lookup type in one lookup file. This means, only SingleInt, only Boolean, only BitField, or only Range. Different lookup types in one file are not allowed. You can (re)load the defined lookups in the custom folder by clicking the Load Lookups and File Lists button in the PRTG web interface under Setup | System Administration | Administrative Tools. A sensor whose lookup file you have modified and reloaded will not re-evaluate this lookup before the next sensor scan. For sensors with large scanning intervals, use the Scan Now option from the context menu to immediately apply the new lookup definition and to avoid an incorrect sensor status. A return value is defined in the lookups that will never be returned by a device because the value is not assigned: The value will never be triggered, so PRTG simply ignores this entry. XML code is incorrect: PRTG will create a new ticket when loading lookups or restarting the PRTG server with a corresponding error message and discard this lookup definition. A lookup file has a file ending other than .ovl: The file will not be loaded. Alerting is disabled or based on limits: Error and warning states defined in the lookup will not apply. Please ensure you choose the option Enable alerting based on lookups in the channel settings if you want to use the lookup definition to control the sensor status. If you define a scaling factor in channel settings, it will not modify the values that are defined by lookups. Any applied lookup always uses the raw value as retrieved from the target device. If you use a scaling factor for such a channel, you will notice the scaling in data graphs, but the channel value will appear unmodified in data tables.